Katimou Maga opted for a career in medicine, but since childhood she has cultivated a passion for gardening. She boasts an impressive CV. After years of working as a doctor, she was chosen by the government of Niger for the difficult job of evaluating the health impacts on the population of the hydroelectric dam at Kandadji (part of the ecosystem restoration program and development plan for the Niger Valley). On weekends, the 60-year-old doctor works her vegetable garden in Kosseye Satom, a village 15 kilometers from the capital, Niamey. 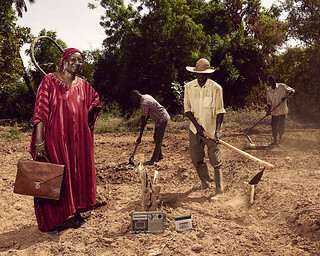 With the help of Issaka Boubacar, her trusty gardener, she grows wheat, rice, cabbage, onions and tomatoes, depending on the season. A baobab tree reigns in center stage. With a Ph.D. in nutrition and biochemistry, Katimou Maga also swears by the nutritional and medicinal properties of the moringa, or “tree of life.” She hopes to upgrade her compatriots’ eating habits by educating them, especially the women. “There are a lot of prohibitions in Niger that are rooted in false beliefs, such as the notion that a pregnant woman must not eat eggs,” she says. In her analysis, the main obstacle to women’s freedom in Niger (more important even than social norms) is lack of access to land and financing. Indeed, research elsewhere in Africa has shown that improving women’s land rights has proven to have large impacts on investment and maintenance of soil conservation measures. And registered land rights could potentially facilitate credit access through the use of land as collateral. A sometime philanthropist, Katimou Maga dreams of building a health center in the village, and has donated a generator to her gardener.